Six Leduc County firefighters will be representing Canada in the upcoming World Rescue Organization’s World Rescue Challenge. 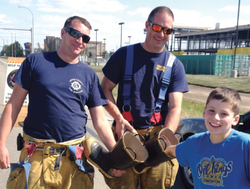 Team Captain, Rob Csolle, said the team of volunteer firefighters made substantial progress in raising the funds needed to attend the competition Oct. 9-12 at Moreton-in-Marsh, United Kingdom, during their boot drive in Nisku Aug. 23. The team raised $6,200 of its $15,000 goal. “We’d like to thank the community and everyone who’s made a donation to this,” said Csolle. Csolle, along with team medic Rod Phillips, Duane South, Dave Sharratt, Mike Overly and Danny Souice will be leaving at the beginning of October, and are hoping to reach their goal with additional fund raising. Leduc County has paid for the team’s registration, but each firefighter is responsible for the rest of their expenses, including air fare, accommodations and meals. The Word Rescue Challenge is one of the most prestigious international competitions for fire and rescue services from across the world. The event will provide an opportunity for international firefighter teams to showcase their rescue skills and techniques while competing against other teams from across the globe. Csolle said the Leduc County firefighters have been competing in a number of these competitions over the years and have done exceptionally well. “We’ve been coming home with something in the top three over the years.” A decade ago when Csolle started, Leduc County limited its participation to a handful of local events but expanded to provincial, regional and international competitions over the years. That commitment has reflected well as Leduc County is the only fire department from Canada to have been invited to the 2014 World Rescue Challenge, which is expected to attract over 300 firefighters along with support teams and guests from 20 countries from around the world and provide a platform for rescue and medical personnel to share and advance rescue science and technology as teams compete in intense, realistic scenarios. “What we learn at these competitions we bring back to the fire department here,” said Csolle. To support the team, donations can be dropped off at the fire hall office at 606 21 Ave. in Nisku.